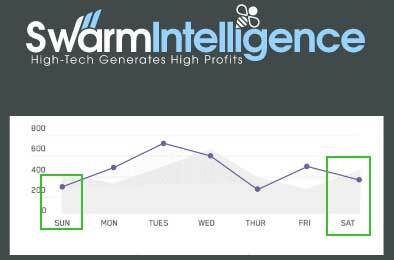 Swarm Intelligence is a new binary options trading software developed by Dr. Steven Francis and Thomas Porter. The software is built to win 83% of its trades and make traders millionaires in a single year. As is always the case, this page will act as a review and area for the binary options community to analyze and discuss the merits of this investment opportunity. It’s quite clear that the Swarm Intelligence product is backed by a very large network of affiliate websites. Just moments after the product was released to the market there were already 15 positive reviews. This seems incredibly disingenuous because a product that hasn’t been around long enough to be tested really shouldn’t be getting the glowing recommendations that it is. With that being said, it’s important to recognize the source of the message so be careful when dealing with these positive reviews. The developers of this software don’t actually exist. While you can see 2 men in the video, it’s likely that they are actors playing their role in the Swarm Intelligence plot. According to the story Dr. Steven Francis is a PhD who has done extensive research in the field of animal behavior. Yet, in doing a handful of Google searches as well as taking a look into Google scholar it’s very clear that this man doesn’t exist. The only trace of Steven comes from the same 15 positive reviews mentioned above. This is obviously deceptive and damages the credibility of anyone involved in this product launch including the network of affiliate websites. The sales page is filled with falsities and discrepancies. In the sales video the developers inform the market that the software was finished in early 2016 and that it’s been tested with a small group of people for a few months. However, a quick domain WHOIS record shows that the Swarm-Intelligence.co domain name was registered just over a week ago. It’s possible that the small group of traders were trading the software before purchasing the domain but that’s highly unlikely considering how professional they’re trying to make this seem. Underneath the video on the sales page there is a chart that shifts between 3 different images. The issue with this chart is that all 3 images show profitable earnings during the weekend. As you likely know, binary options can’t be traded on the weekend. This makes it seem like the people behind this software don’t have a clue about binary options trading and how it even works. The Swarm Intelligence trading system is not ready for the public. While there are a handful of positive reviews online, it’s very clear that these can’t be trusted. They are obviously associated with the developers of the system. There are way too many discrepancies and marketing ploys in this sales page that need to be resolved before the product can be determined fit for use. In the meantime, take a look at what’s working for the Binary Today readers by perusing John Kane’s personal Income Reports. The November edition will be arriving shortly so keep your eyes pealed.